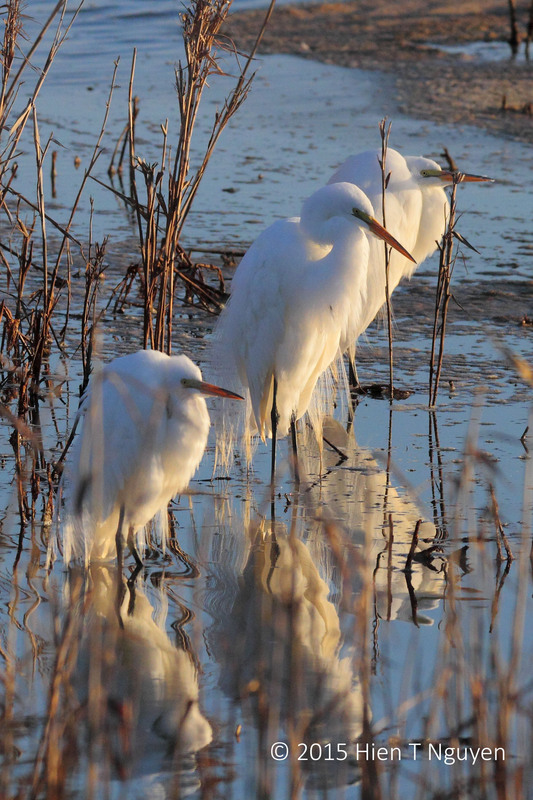 These are such great shots Hien, so worth of the majesty that egrets have…and the lighting makes the mood. They are beautiful! Great pictures! Thanks Agnes. Glad you like them. Thank you, Tiny! The light at 7:30 in the morning was very good, and there was no haze. It was as though they knew you were there to take their photograph. The colors of the light, their feathers – all picturesque. They indeed stood there, only moving their necks and bills, waiting for their photographer to get his act under way! 🙂 Thanks, Mary. Thanks Helen. 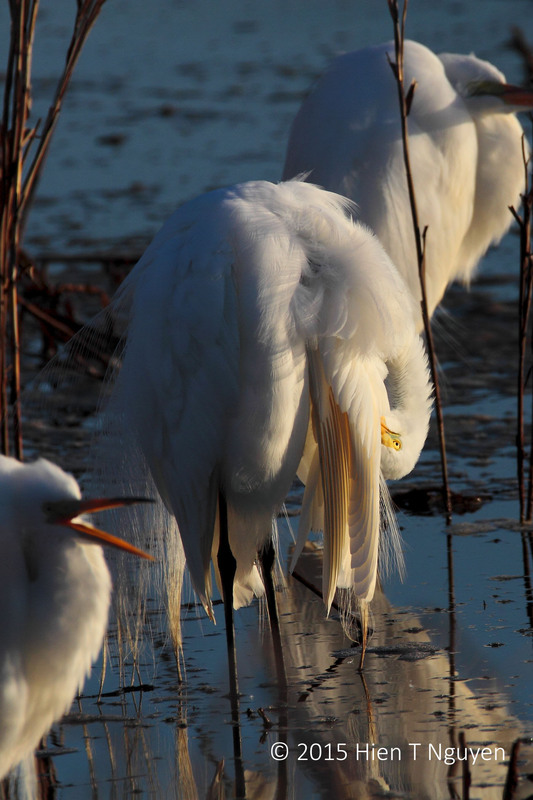 Like Judy said below, the egrets spend a lot of time preening and cleaning themselves. Looks like a serene day out at the refuge!! Yeah, Egrets spend an awful lot of time preening all those lovely feathers don’t they. It is fun to realize that the birds I am seeing here in Florida, you are also seeing in your neck of the woods. By the lores turning green and the abundance of aigrettes yours are getting into the mood for love too! I expect my season begins before yours and advances northward. 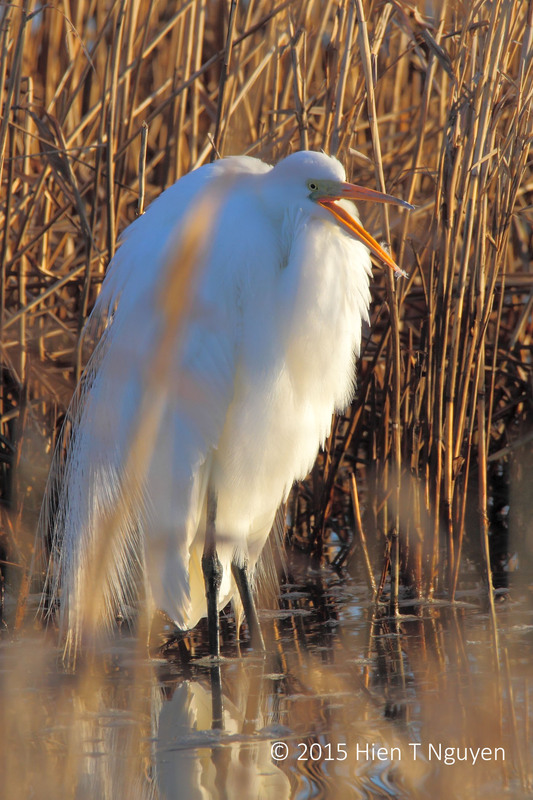 Those aigrettes nearly cost the Great Egret its existence when they were nearly hunted to extinction for their lovely plumes. And I used the word ‘hunted’ lightly since the birds were often shot right in their nests sitting on their eggs because that is when the plumes are most luxurious. They begin to drop off and thin out the older the chicks get. I think of them as a bridal train!! Thanks Judy. I am glad that fashion has now bypassed airgrettes, and that the Great Egrets have survived to these days.